In a small village of Kammansanda once a saint had the vision to build a temple with one crore Shiva Lingas and he installed the first Shiva Linga on 10 Oct 1980 which was followed by devotees installing Shiva Lingas from various parts of the world. Today the Kotilingeshwara Temple is home to Ninety Lakh Shiva Lingas and is also the home to the tallest Shiva Linga in the entire world which stands at 108 feet tall. Most of our vacations during my childhood were planned to places of pilgrimage, and my father being an ardent Shiva devotee, we ended up visiting numerous Shiva temples all across the country. By now I have lost the count of the number of Shiva temples that I have visited over the years. But luckily most of these temples have always been in exotic locations. I love to visit temples, marveling at their beauty and the architecture and admiring the craftsmen skills and the interesting stories that are associated with each one of them. 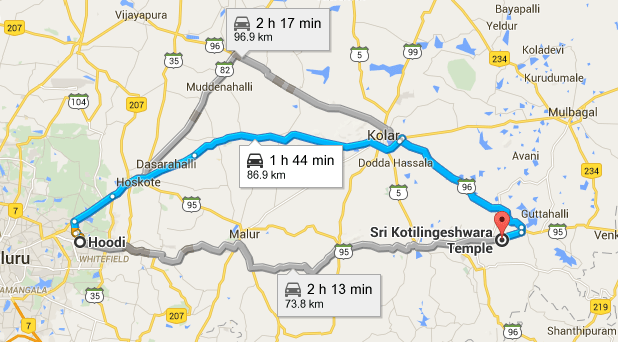 One fine weekend when we had nothing to do we planned a day trip from Bangalore to Kotilingeshwara temple. We started around 10:30 am from Bangalore via Hoodi circle towards Kolar Gold Fields. We passed by hills strewn with huge boulders which were a stark contrast to the blooming marigold fields while on our way to the temple. The roads were nice and we relied on Google Maps for directions. We were at the temple in an hour or so. As we reached the temple, we found very few cars parked there and the temple was not that crowded as we thought it would be. We bought our tickets as we entered the temple. The temple houses millions of Shiva Lingas of various sizes and designs placed all over the temple. The walls of the temple are painted in different colours to give a surreal effect to the entire place. Unlike other South Indian temples, this temple is quite a peaceful place to be, with no guides running behind you or a long queue to enter the temple premises. There was already a small queue to visit the first temple which is dedicated to Brahma, Vishnu, and Maheshwar. After offering our prayers in the first temple, we proceeded towards the main temple passing by a sacred tree covered with yellow thread for good luck and wishes. By the time we reached the main temple, afternoon Aarti was about to begin. The Aarti was accompanied by the beating of drums and then the priest distributed prasad and offered Aarti to all of us. The exit from the main temple leads to a courtyard which houses temples of many other gods like Lord Venkataramani Swamy , Goddess Annapoorneshwari , Lord Panduranga Swamy , Lord Panchamukha Ganapathy , Lord Rama, Lakshmana and Goddess Sita , Lord Anjaneya , Goddess Kannika Parameshwari and Goddess Karumaari Amma. This courtyard is also a host to the tallest Shiva Linga in the world measuring a whopping 33 metres. As per the project, the target is to install one crore of Shiva Lingas hence the name is ” Kotilingewasara Temple”. But as of now, only 9 Million Shiva Lingas has been installed. Shiva Linga installation can be done by devotees at a starting price of INR 6,000/-. Devotees have a choice of installing Shiva Linga’s of different sizes and also can have their name engraved near it. We saw few families offering prayers to the Shiva Linga they or their families had installed. 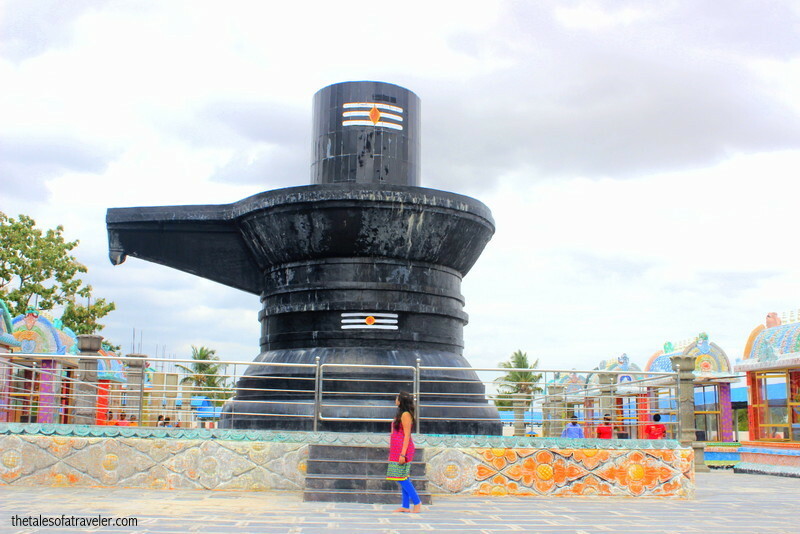 In front of this huge Shiva Linga there is a statue of Nandi which is 35 feet (11 m) tall. The statue of Nandi is installed over a platform which is 60 feet (18 m) in length, 40 feet (12 m) in width and 4 feet (1.2 m) in height. Houses 90 lakh Shiva Lingas of various sizes. The temple founder Swamy Sambha Shiva Murthy has performed free mass marriages for the past 4 years for 360 couples. Today the temple performs at most 15 to 20 marriages for 4 days in a week. The temple collects a nominal fee of around Rs 200 for each marriage. They make all the arrangements including the Priest, Drums and Music for the marriages. The annual Maha Shivaratri Festival celebrated at the temple attracts thousands of devotees from all over India. There aren’t any proper restaurants till Kolar. Better to stock your car with food and water before you start. Not a single Mac D on the route. There are few south Indian restaurants once you reach Kolar near the highway and food is just okay. Temple also provides free meals during Lunch time. Roads are awesome and reaching the temple is a breeze. Yes, fortunately just one and that too was priced at INR 24 for multiple entries for a day. There are buses which ply from Majestic and K R Puram bus stop every couple of hours. The nearest airport is Bangalore Airport. The nearest railway junction is Bangarpet at a distance of about 15 km. Thanks for sharing less explored site. Interesting temple. Would definitely visit sometime. So close to Bangalore and I haven’t visited yet. Lovely pics from the place. Hope to visit and install a linga there some day! I liked the marigold fields the most. I’ve been wondering where they grow all these beautiful flowers for various religious rituals – there are so many of them at the market, but in the parks and gardens they are nowhere to be seen. The pictures tell me that it was a great trip! Hey I’ve seen pics of this place many times.. but you clicked them so nice and colourful.. may I ask you which camera you used.. and have u retouched the photos? Nice work really..
Amazing photos!. Feeling blessed. This post is explained very well about the place. Excellent , we are planning to visit Today. i have not visited yet, planning to go on next weekend, appreciate your well explained trip with photos. Thanks for ur details .. It has helped me .. Very clear information. Many thanks. Your experience is guide to others. Sudhakar G.
very informative for prospective visitors like us. Very good information brother. Thanks a lot. Visited on August 2016. Felt like they built this temple to loot the people. 30 Rs for parking payable. Once you enter in every temple priest will tell to pay money and its compulsory if we don’t pay they will tell directly don’t come inside temple next time. Hope our journey is happy . Thanks for sharing d info…it was very detailed..
what is place of koti lingeshwara temple . plz discrip me the address . Must say a very nice writeup and beautiful photos. Please watch our vlog on bike ride to Kotilingeshwara temple and Kurudumale from Bangalore to get a Vortual experience of the trip. Awesome and very detailed post. It will be very helpful for new visitors like me. It was nice to read about Kotilingeshwara temple here. I just published the story of my visit to the same temple near Kolar. Will see u! hi thanks for deails, we will go this temple. it was really helpful article….thanks for the details…..
Really helpful information. I came to know many interesting things in this article. Planning to visit this temple after reading this article. Nice information. After reading this article I have decided to visit the temple. I think it will be really useful for me during my visit.